With a forecast of cold weather accompanied by record oil prices, droves of cyclists are expected to be donning their wool base layers, jerseys, and cycling sweaters both on the bike and off the machine this winter. According to Joneswares co-owner, Lynn Jones Peredina, the company is beginning to see an increase in the number of riders ordering multiple layers in anticipation of the chilly times ahead. "We've had riders email us that they are ordering wool clothing this year that is going to work for them both cycling, as well as, general wear. People are beginning to realize that a bit of conservation at home is going to save them some serious money." Wool provides superior warmth, durability, comfort, and on top of the fact that it is just plain comfortable, wool is a renewable resource. "Riders look at these pieces as a valuable investment; an important consideration given our economic times," added Peredina. We all know the facts; lowering your thermostat by even a few degrees will help save. Deb Jones Bachrach of Joneswares has noticed an increase in the number of riders, as well as others, stating they are ready to conserve. Thermostats are going down, while more and more riders are planning on using the bike to commute this winter. Wool is definitely part of the equation. And as they say at Joneswares "...think of your base layer as an extra layer of insulation." 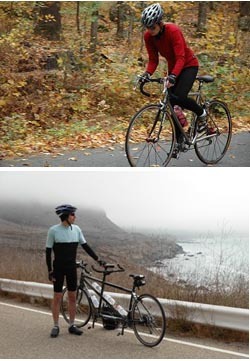 Joneswares provides high quality functional cycle wear and apparel for all fundamental activities. They are proud of the fact that all their garments are made in the USA and use Merino wool that has been processed in an eco-friendly manner. (The fiber from the Merino sheep is ultrafine providing a soft, great 'next to the skin' feel.) Fabrics coming from New Zealand follow the strict guidelines established for the Zque (ethical wool) Program. Vermont Organic Fiber supplies the Company with O~Wool yardage knit stateside and manufactured to established earth friendly/organic processes. The result of this type of processing is luxurious, super durable wool fabric that, with the proper care, will last a lifetime. Offering everything in wool from head to toe and all the parts in between, Joneswares garments are designed to provide warmth and comfort. From wool helmet liners to base layers and cycling jerseys to riding tights and socks, they are committed to making sure riders benefit from the Company motto '...get (real) comfortable...' no matter the activity! To see their complete line, visit the website www.joneswares.com.